Buying a pre-owned Rolex watch can be a foolhardy venture for the naive or those inexperienced in this area, and even occasionally for those that should know better. When significant sums of money are exchanging hands there is always the risk of unscrupulous and unprincipled people getting involved and trying to make a quick buck. It is therefore very important when dealing in this area to do your homework thoroughly and minimise the risks of becoming a victim of one of these charlatans in every way you can. The only fool proof method of protecting yourself from unknowingly buying a fake Rolex watch is to have it checked by the manufacturers themselves and this is what we would recommend you do when you are thinking of parting with hundreds, if not thousands, of pounds. At the very least we believe you should consult an experienced and trusted expert and only deal with sellers who are known, have a good reputation and stand behind their products 100%. Despite the doomy tones of these introductory remarks, there are many very good sellers out there; just bear in mind there are others that are less so. There are also things you can do to help yourself as well and that would start with having an awareness of some of the more obvious mistakes fakers make when entering this market. Here are some fundamental pointers that may help you get a feel for whether a deal is worth pursuing or not before it all gets too serious. 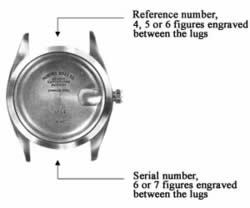 The majority of Rolex Oyster watches are allocated a model (or reference) number and an individual serial number. If you take the bracelet or strap off of the watch and look closely between the lugs of the case at the 12 o’clock position you will find a stamped model number. Obviously it is important that this model number confirms that the actual watch you are looking at is as described. We have included a sample of the numbers allocated to some popular models here for reference but this is by no means a full list and further information on model numbers can be gained from Rolex catalogues or from other publications available on The Net. Between the lugs at the 6 o’clock position you should find the unique serial number of the particular watch you are investigating and with this you will be able to establish if the watch is lost or stolen by quoting this number to your local Rolex service centre and asking them to confirm it's status. S serial numbers were introduced in 1993 and W ones first came in during 1994 and T serial numbers were first introduced in May 1996 BUT all these are still current; with this new numbering system, numbers are generated almost randomly. The reasons for this were not disclosed to me, despite asking the question. I was met with the telephonic equivalent of an ‘enigmatic smile’. If you think things are now really confused........ it gets worse!! The letter U was introduced in August 1997; and will run concurrently with S, T &W. However, things were not yet complex enough for Rolex, so the letter A was introduced in November/December 1998 and will also run concurrently with W & U. Please note that Rolex are now using the prefixes U, A and P randomly assigning numbers; therefore the exact date of production can only be ascertained by access to the records kept at Rolex, Geneva." © 1996/2001 James M. Dowling & Jeffrey P. Hess, from The Best of Times Rolex Wristwatches, published by Schiffer Publishing Limited. The only current production watch that has writing on the back is the Sea-Dweller. Therefore, if it has writing engraved on the back and it's not a Sea-Dweller, walk away. The bubble which sits above the date window, if fitted, should magnify the date by 2½ times. All Rolex Sports watches, except the Sea-Dweller, have a date bubble. The seconds hand should move around the dial in a smooth action. If its movement is one of ‘stop-start’, it has a quartz movement inside. This would be correct for an ‘Oyster Quartz’, but not for any other model of Rolex. The date should change sharply and accurately at around midnight. If it starts changing well before this time, it is not a Rolex. However, if it does change sharply but at say 15 minutes past midnight it might be real, but it requires some attention from a qualified watch repairer. The printing should be crisp, sharp and in the correct font. For the Red Submariner, the word ‘Submariner’ should be no longer than the line of writing below it. In this example the forger has even got the depths wrong! The final point is one that has been already stated, there is only one way that you can be sure a pre-owned watch is 100% genuine and that is to have it authenticated by Rolex themselves. The pointers outlined here are intended to help you carry out a few preliminary checks and are no substitute for the experienced eye of a watch technician. Even if the watch that you are considering does not have any of the above faults, you cannot assume it to be authentic; forgers are clever and resourceful and becoming more so every day, so be aware.